This is a drawing that i sent in to took part a small competition organized by sgcomic.com but end up I didn't make it on time. I was imagine that the Santa is actually a red hair thief like Robin Hood, he rob the rich and help the poor. 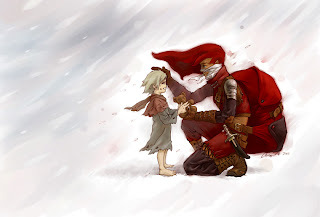 This is a scene that of the thief bringing a present to a poor girl in the winter and the littler girl thinks that this guy is actually the Santa.